Impress with a perfect blend of our freshly picked flowers to adore together with our cute and cuddly soft toys going all the way to your affectionate ones living miles away from you. What more do you need for a dazzling Valentine eve? Go and grab this Flower and Teddy combo now! With technology coming in and making communication easy, there are definitely times when we miss the old school romance. Times when we waited days to meet the person or talk to them. It had its own beauty. So, why not revive the romance and cherish love the old way. 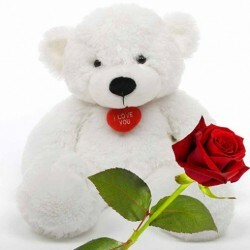 Opt for romantic expressions of love like Valentine’s Day flowers and teddy bear. For centuries, flowers are considered the best way to profess and convey love. So, this Valentine’s Day, make your significant other feel super special with Valentine’s Day flowers and teddy bear because love feels better when it’s expressed. MyFlowerTree has a vast collection of Valentine’s Day flowers and teddy combo to bring a hearty smile on the face of someone you love. Especially if you are living afar, gift Valentine teddies online from MyFlowerTree along with fresh Valentine flowers and send hugs and cuddles from far. Cute Little Rosy Combo, Love Duel, Luxury Combo etc are to name a few popular Valentine flower and teddy combos online that are sure to impress. Therefore, whether you are looking for a cute gift for her or him on Valentine’s Day, don’t give any second thoughts and choose MyFlowerTree for all your gifting needs needs. Do you share a long distance relationship with your significant other? Does it get difficult for you to communicate what’s in your heart? MyFlowerTree gives you an option of sending Valentine’s gifts to your special someone and convey your feelings in a grander way than saying it over phone. 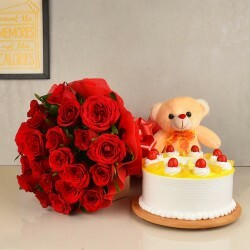 If you are caught in the hustle and bustle of life and find no time to ignite the lost spark, count on MyFlowerTree for Valentine’s Day flowers and teddy bear combo and build a strong relationship despite being miles apart. MyFlowerTree provides instant delivery of Valentine gifts to your loved ones even when they are residing in any other corner of India. 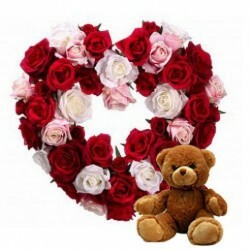 Make your pick from Valentine’s Day flowers and teddy bear combo online and opt for same day delivery or midnight delivery of gifts to convey your emotions in the best way. And with timely delivery of Valentine’s gift hampers, why go somewhere as you get all the perks under one roof. Therefore, make memorable love expressions during this season of love through your reliable floral and gift portal, MyFlowerTree.